The NoHo Arts District dot com team likes to feature folks who contribute to the arts and especially theatre in the North Hollywood. As we always say, "We are only as great as our people." "I was delighted to appear as Ernest in Tad Mosel's IMPROMPTU at the beginning of my professional acting career back in 1980. I was lucky to direct the play with my own multiracial chamber theatre, THE EXCALIBER SHAKESPEARE COMPANY OF CHICAGO in 2001. And now I feel blessed more than 35 years later ( in 2016 ) to return to the role of Ernest bringing the experience of a lifetime in The Theatre to it. And I am thrilled that the lovely folk with THE EMMANUEL LUTHERAN ACTORS THEATRE ENSEMBLE - ELATE are giving me the opportunity to make my North Hollywood Area stage debut in Tad Mosel's gem of a play, which is one of four fine short works that make up JUST 4 FUN." Expertly staged by long-time ELATE play director and multiple EMMY-Nominated television producer JEFF ZIMMER ( “The Doctors”, “America’s Funniest Videos” ), Tad Mosel’s “IMPROMPTU” is an allegory about life upon the stage. As debonair, but aging, leading man Ernest, Mr. Robinson is one of four actors summoned to the theatre by an unseen and mysterious stage manager, and informed no one may leave the stage until the group has improvised a play! Joining Mr. Robinson on the boards for this humorous and dramatic exercise are LUCY KRUBINER as the young ingenue, Lora; JOEY TREZISE as the young male juvenile, Tony; and skilled veteran CASEY KRUBINER as the sharp-tounged character actress, Winnifred. DARRYL MAXIMILIAN ROBINSON first played the role of Ernest in Tad Mosel’s “IMPROMPTU” at a small performance venue on the north side of The Windy City towards the beginning of his acting career in 1980. He also directed the play for the ESC in a production mounted at The Harrison Street Studio Theatre of Oak Park, Il. In 2001. Mr. Robinson is thrilled to return to the work under the skilled direction of JEFF ZIMMER, and is delighted to make his debut onstage in North Hollywood with THE EMMANUEL LUTHERAN ACTORS THEATRE ENSEMBLE – ELATE. 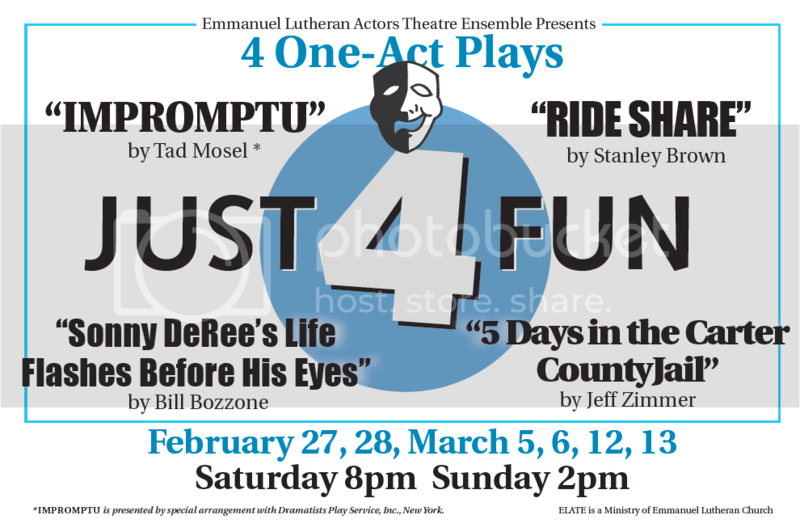 Other works in “JUST 4 FUN” include: Bill Bozzone’s “SONNY DEREE’S LIFE FLASHES BEFORE HIS EYES”, about a desperate man whose only hope to keep from being killed by a hit man is his mother; Jeff Zimmer’s “5 DAYS IN THE CARTER COUNTY JAIL”, a comedy inspired by the real-life story of a county clerk who goes to jail rather than violate her religious beliefs; and Stan Brown’s “RIDE SHARE”, about a Uber driver and a passenger with a secret. Mr. Zimmer will stage “Sonny DeRee’s” and his “5 Days” in addition to “Impromptu,” while Mr. Brown will direct his original work, “Ride Share.” “JUST 4 FUN” A QUARTET OF ENTERTAINING AND UNIQUE ONE ACT PLAYS is produced by long-time ELATE member WENDY HIRSCHMAN. How do I get in coat with daryl maxamillion Robinson? ?